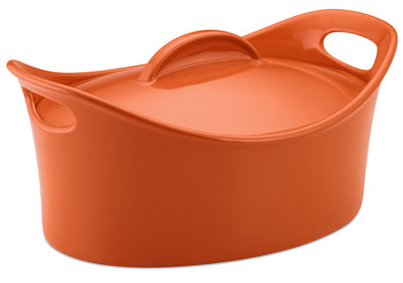 Rachael Ray Stoneware 4.25 Qt. Covered Casseroval Baking Dish Only $18.74! Down From $100! You are here: Home / Great Deals / Rachael Ray Stoneware 4.25 Qt. Covered Casseroval Baking Dish Only $18.74! Down From $100! Macy has this Rachael Ray Stoneware 4.25 Qt. Covered Casseroval Baking Dish (in Red or Orange) on sale for $24.99 (Reg. $100.00) but you can get it for only $18.74 when you use promo code FRIEND (25% off) at checkout! Plus shipping is FREE on orders over $25 or with any beauty product purchase and you may be able to get FREE in-store pickup! A feast for the eyes. In a bright hue & a classic shape, this oval dish dresses up your meals. The stoneware piece features wide grip handles that make prep-to-presentation transport easy & a durable construction that is safe for oven, freezer, microwave & dishwasher use. Great for baked pasta, casseroles, chicken & more!